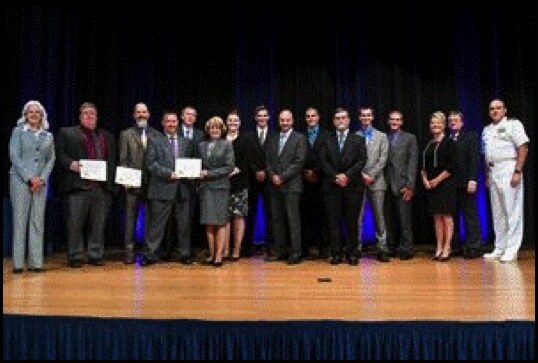 Mr. Zane Ubelhor, Systems Engineer of NSWC Crane Division, his team and two other teams were part of receiving three prestigious value engineering awards at the Department of Defense on Tuesday, July 18, 2017, at the Pentagon auditorium. They were recognized for building and delivering The Wide Field of View Night Vision goggle that changed the size, weight and power improvement of nearly 40 percent for the military. They delivered this in a shortened time that resulted in a savings of 12 months and realized cost benefit of 9.53 million. Zane is the son of Brenda Ubelhor in Data Entry, and is pictured 8th from left.